The Ford Performance Club of North Texas (formerly known as SVT Club of North Texas) was founded in October of '98 as a club for SVT enthusiasts. Although the primary focus was SVT vehicles, our club has a diverse membership of all Ford-powered performance oriented vehicles and is open to owners of SVT and Ford performance vehicles. The club holds many functions each year including car shows, racing events, dyno days, fun runs, charity and other car related events. 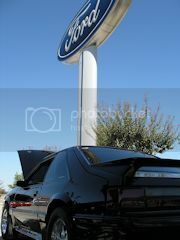 Ford Performance Club of North Texas meets on the 2nd Saturday of every month at 5:00pm. Please check our Events calendar or our Forums for our next meeting location. Feel free to come by and see what we're all about! » Like us on Facebook and follow us on Twitter! Most users ever online was 356, 02-25-2014 at 10:27 PM.